Why is the ransomware threat so important? 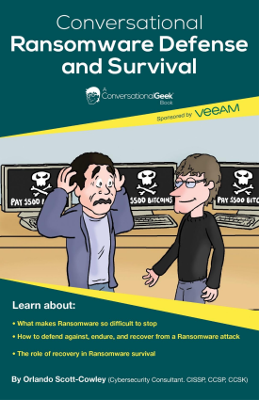 Veeam and Conversational Geeks collaborated to publish Conversational Ransomware Defense and Survival, an e-book that illustrates the fundamentals for ransomware preparation, protection and recovery. As the title suggests, the book is written in a conversational tone, so it’s easy to read and it addresses both the unlucky ones who have already struggled with ransomware and those who are willing to learn more about this cybersecurity threat. Thinking that ransomware “can’t happen to me” is a dangerous approach and it can cost you a lot! One key learning of this book is that the best protection strategies against ransomware attacks are preparedness and recovery. This guide also talks about the importance of backups and how they can prove to be vital for restoring damaged or lost data when a ransomware attack occurs. Because yes, ransomware is a matter of WHEN, not IF. Your ransomware protection plan should be designed based on the 3-2-1-0 Rule, a simple yet very effective best practice. You’ll also learn that for an organization to be stronger against ransomware, it is very important for end users to understand the risks that they are exposed to. They should be trained on how to deal with email attachments, unsafe websites and their network connections. To better understand the dimension of ransomware, there are “Ransomware as a Service” (RaaS) platforms run by cybercriminals who even provide customer support to negotiate the ransom. The first RaaS platform was introduced by CryptoWall, the most notorious ransomware so far, and it requires no technical knowledge. Conversational Ransomware Defense and Survival is a very useful resource for everyone who needs to understand the ransomware threat in a simple and straight-forward manner. Cybercrimes are increasing in volume and efficiency, but we should be active in adapting our knowledge and technology to stay safe. Register and download the Conversational Ransomware Defense and Survival e-book for FREE!